The National Research Council (NRC) is the home of ground-breaking psycho-acoustical research that has become the standard by which leading loudspeaker manufacturers measure sound reproduction. Read on to see how Axiom, one of the founding companies of this research, uses these principles connecting the relationship between technical measurements and listeners' impressions in double-blind listening tests. Axiom Anechoic Chamber. Click Here to view the development. Pictured above is the anechoic chamber—literally, a room with no echoes—at the National Research Council of Canada in Ottawa, Ontario. But it’s no ordinary room - lining all six walls of the chamber are large fiberglass wedges that absorb all reflections from the loudspeaker. 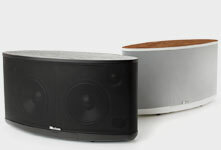 Inside it is an Axiom M22 speaker, supported on a pedestal that can rotate to either side as well as tilt up and down. 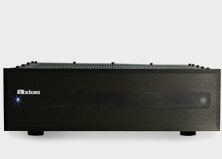 This is where the initial design and frequency response of the M22 (which has received glowing reviews from a variety of critics and reviewers), was refined, measured, and fine-tuned by its designer, Axiom founder Ian Colquhoun. As you look at this picture, what may seem odd is why a loudspeaker meant to be listened to in normally furnished rooms would have its performance measured in a room that no-one would care to live in. The reason goes back to not only how we hear speakers in rooms, but also to a remarkable history of speaker measurement techniques and listening tests that took place in this scientific facility sponsored by the Canadian government. Axiom Electronics Engineer Tom Cumberland adjusts the B & K Frequency Sweep Generator which feeds frequency response sweeps to loudspeakers during testing. When we hear a speaker in a normal room, the sound that reaches our ears is made up of a multiplicity of direct and reflected sounds. Sounds travel at about 1 foot per millisecond, so when the speaker is reproducing music, some of the sound from the tweeters and woofers travels directly to our ears but a large proportion is also reflected from side walls, the floor, the ceiling and objects in the room. Those reflected sounds reach our ears a fraction of a second—a matter of milliseconds—after the direct sounds, and they’ll be different in every room, because of varying dimensions and distances and dissimilar furnishings. So the goal of putting a speaker in a chamber with no echoes is to find out exactly how much energy a speaker radiates when it’s unaffected by such reflections. (You could achieve the same result if you positioned the speaker on top of a tall pole in a quiet country field and measured it that way—far from traffic or urban sounds— and indeed Axiom designer Ian Colquhoun measures speakers that way before he flies to the NRC to do formal speaker measurements and listening tests.) When a speaker’s output directly in front of the speaker and at increasing angles to each side and above and below it is as smooth and as similar as possible, the designer can be reasonably certain it will sound fairly accurate in a normal room, because the reflected energy will have roughly the same tonal balance as the speaker’s direct energy on-axis. Over the course of more than 20 years, the validity of these measurements has been confirmed by double-blind listening tests conducted in a nearby NRC listening room that approximates the size and furnishings of a typical living room. The program was guided by Dr. Floyd Toole, a Canadian physicist and psycho-acoustician who received his PhD in England in stereo localization, and continued his experiments at the National Research Council beginning in the 1970s. In his search for an accurate speaker with which to conduct his experiments, he discovered wild inconsistencies in speaker design and measurement, and an absence of controlled scientific research. Since he was already an audiophile, Toole invited several young Canadian speaker designers, including Axiom's Ian Colquhoun, to work with him in evolving new speaker measurements and listening tests (part of the NRC’s mandate was to assist Canadian firms in product development). Toole gathered the results of these tests of frequency-response measurements and controlled listening tests by listeners with normal hearing and wrote scientific papers that were published in Audio Engineering Society (AES) Journals. The papers, "Listening Tests: Turning Opinion into Fact" and "Loudspeaker Measurements and Their Relationship to Listener Preferences," were unprecedented and Toole was later elected President of the Audio Engineering Society worldwide. 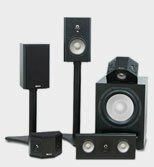 The results of Toole’s research on speaker measurement and listening tests were startling and got lots of attention. The NRC program also had the willing participation of Canadian hi-fi magazines, editors and reviewers, beginning with AudioScene Canada and later, Sound & Vision Canada. The magazines needed a good facility to do controlled tests of a variety of Canadian, British, and American speakers for the magazine readers, and Toole’s program needed loudspeakers to experiment with. As a reviewer for AudioScene Canada, and later as editor of Sound & Vision (Canada), I was proud to be a member of the NRC listening panel for many years along with Floyd Toole, and Ian G. Masters (former editor of AudioScene Canada). (Ian Colquhoun, Tom Cumberland and Axiom M80 pictured in the anechoic chamber). 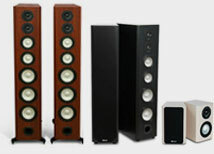 Of course, sonic benefits accrued not just to Axiom’s speakers but to other prominent Canadian speaker builders as well. The findings of Toole’s program were in one sense startling and at the same time remarkably useful: When the brand name, size, type and price of speakers were concealed from listeners, persons with normal hearing agreed on which speakers sounded pleasing and accurate —"musical" if you will— and which ones were inaccurate and downright unpleasant. In the course of these tests, the notion of "golden-eared" listeners was largely dismissed. As long as listeners had a few hours of training on what to listen for ("fat" emphasized bass, strident harsh treble, muffled midrange, narrow "boxy" colorations and the like), they ranked good speakers and bad speakers the same way. And what was even more intriguing: If a speaker’s on-axis (in front) and off-axis frequency-response measurements could be kept as similar as possible, especially within a 15-degree "listening window" and especially over the midrange, the speaker would score highly in blind listening tests. While this is an oversimplification of decades of research at the NRC and by individual designers at Axiom and at other firms, it has proven to be extraordinarily predictive. Although no two speakers designed according to the NRC mantra ever sound exactly alike, there is nevertheless a remarkable congruence in what might be called "the Canadian sound," and that is one of openness, transparency, "linearity" (smoothness), and fidelity.